Buying and selling domain names is not child’s play as one may falsely believe: it involves painstaking research into Internet trends, corporate identities and other popular stuff. Extreme patience is something more you will definitely need. And of course, money is the most important requirement if you are planning on making some serious money buying and selling domain names. Before proceeding further, I will explain what is domain. In simple language, domain is the name of a website. It is followed by a suffix such as .com, .org, .biz, .edu, .gov, .xy x or even country codes such as .nl, .tk, .be, .in, cn, .ph and so on. For example, ah.nl is the website of a very popular chain of stores in the Netherlands. While ah is the domain name, it is followed by suffix .nl to indicate country where it is located. However, generalized websites like Google have .com as suffix while organizations would generally use the suffix .org. There is only one reason domains exist: Just like your unique name, they provide an online identity to a website, business, organization or government department. There are billions of individuals and organizations on the Internet. Domains help people to zero down on information or service they want. Since billions of domains are already active online, every individual or organization seeks a name that matches their interest or business while helping people to find them easily. This is the main reason individuals and institutions look for excellent domain names. And this is where you can make money buying and selling domain names. Domain flipping is very simple and straightforward online business similar to real estate business which involves buying of the domain name at low price & selling it at higher price where the margin becomes your profit. However, it can be less complex by adding a couple of steps in the basic process. It is a business that requires buying, developing, monetizing and sell it off to make more profits. Domain flipping is wonderful, cost effective money making opportunity if you have given time and efforts and developed real guts to learn how it is exactly done. As we mention earlier, buying and selling domain names is not easy. However, you can make considerable money provided you have the patience and some money plus, willing to exert some extra effort. If so, then here I present a step-by-step guide on how to make money buying and selling domain names. Buying a domain is not very expensive. You can buy a domain name for as low as US $6 per year. However, the standard price of a domain ranges between US$10 and US$15 per year. Understandably, some domain names would be pricier depending on ease of use. But the pricier ones will usually be sold by other domain flippers. It makes sense to buy a good domain from another seller provided you already have a client or are extremely confident of finding one. Remember, buying and selling domains is not brisk business. Should you block larger amounts of money, you stand the risk of losing it completely or waiting too long for a client. Therefore, investing too much money as beginner is not advisable. I will suggest you to keep a budget of $1000 that will help you to buy 75 to 100 new domains including .com, .org, .net domains or country specific domains. You can even try buying expired domains. Once you get the experience along with profits through this business, you can make this a full time business. There are countless industries and activities worldwide- from complex manufacturing to space exploration, spirituality to education and sports. Understandably, you cannot buy domains that suit every sector. 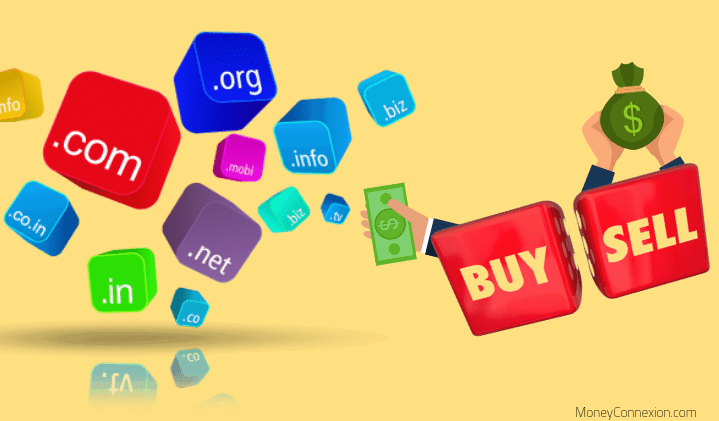 Therefore, you need to identify a particular activity in which you wish to specialize for buying and selling domains. Identifying a sector or activity enables you to focus efforts on finding latest trends, upcoming events and activities and various other elements for which someone may need an appropriate domain name. Such knowledge is precious when it comes to buying domains for cheap because nobody would want that particular name. But once something becomes popular, other domain flippers will rush to buy, which sends prices spiraling upward. A good example is movies. A domain for a new movie will have no takers before it is released. But once it hits the cinemas, a matching domain will generally become unavailable. Before investing on domain names, look for keywords that are likely to get buyers interested. Nowadays there are various resources such as Niche Finder, Google Keyword Finder, Ahrefs and others where you can research for names that figure in the highest number of searches. Keep your eyes open for anticipated product launches, new releases, upcoming events and other things that are likely to generate a high interest in matching domain names. A great way to find what is hot and trending is from this excellent free resource, Google Trends. It will provide excellent information of latest and future trends. Book a domain based on these trends since that would most likely attract a good number of bidders. Another excellent way to buy domains is by including a geographical location. Since some specialties are location specific, including its name in the domain can attract more buyers. For example, a Yoga institute will look for a name that identifies itself with India or Asia. You can find some great domain names for cheap by keeping in mind these simple steps. Shorter Names: As a rule, buyers of new domains look for those with shortest length or abbreviations of their company name. For example, Nederlandse Spoorwegen, the railway network of the Netherlands has a very short domain name: ns.nl. The shorter the domain name, better the demand since they are easy to remember. Branding: Another aspect to consider is branding. Some great examples are Facebook, Twitter, Google and Yahoo. These names are extremely easy to remember. While buying a domain, just imagine how the name sounds as a brand. Is it east to remember and can become popular? Common Words: Find domain names that use common words in the English dictionary. For example, thingsinindia.in delivers what its domain name claims: it informs and educates people about various things pertaining to that country. The name is simply a combination of common English words. Old Domains: If you come across old domains that are no longer in use, buy them immediately. These old domains or expired domains have history and some rankings on Google. They would also have a history of traffic and dedicated visitors. Looking for old domains is fairly easy on websites including DynaDots, ExpiredDomains and JustDropped. The first rule in buying a great domain name is by avoiding those that already have been trademarked. Obviously, a well-established, reputed business with long history is not going to pay you a penny for similar sounding names. Worse, you may end up with a lawsuit. There is no point in registering a domain name like Amazon.Org since this global online retailer owns trademark for the name. Shortlisting a great domain name takes time. As mentioned earlier, it involves several processes such as finding great keywords, expired domains, shorter domain names and studying trends. Once you have drawn a list of several domain names, finalize only three or four that show promise of demand in the market. Buy only these domains. Remember, it is myth that most buyers opt for .com suffixes while choosing a domain name. A company will usually opt for several matching names with different suffixes such as .com, .org, .net, .biz and even those that are country specific such as .br, .in or .pt, among others. But as I explained earlier, an established brand will never look for a matching domain name with a different extension. Walmart.com will never buy Walmart.net, for example, though you may invest heavily on buying the domain. You can make more money by selling a set of similar domain names with different suffixes to the same client provided they are new or wish to maintain exclusivity. After all, no organization or individual would want to share a domain name with rivals or other parties. A similar domain name with different suffix can prove disastrous to the buyer since people may be inadvertently directed to the matching, rival one. Buying matching domain names with different suffixes can sometimes prove cumbersome. Someone may already have taken one. Thus, the value of a domain you will buy for flipping drops drastically. A business owner or individual will usually aim for exclusivity and reject a domain name that has already been taken albeit with a different suffix. A good way to buy cheap but excellent domain names is during sales and auctions, when heavy discounts are on offer. Generally, every major domain seller will have a regular sale or auction. This is the best time to buy multiple domains for cheap. However, you will need proper studies before buying at sales. Find out what domains will most likely be in high demand during the next few months or even a year. Buying multiple domains with different suffixes can prove very economical during sales and auctions. You can sell them as a bundle to a single buyer looking for exclusivity. Understandably, this will require some patience and sufficient investment. Never enter the market with a couple of domains only, if you are serious about making money on this lucrative trade. Instead, do some research to find which domain names will have more takers and buy a few. Once you have adequate domains in your portfolio, look for the right time to put them up for sale. Some domains may have seasonal demands. Hence, selling them as a season nears will ensure you get a higher price. Rather than offering a few domains, put the entire range on sale. This way, you generate more interest among buyers. It speaks a lot about your investment abilities as prospective buyers will know you are not a mere fly-by-night operator but someone rather keen on this business. Rather than marketing your domains on a single platform, it makes good sense to offer them on various other websites. This increases visibility of your portfolio while offering clients to buy them from a reseller of their choice. Also, offer multiple payment options. Generally, domain sellers are required to provide details of their bank account. Instead, you can also opt to receive payments through PayPal and other channels. GoDaddy, Big Rock and Namecheap are market leaders. But there are other websites too where you can list your domains for sale. These steps are the very basics to make money buying and selling domain names. If this trade interests you and are willing to take the required steps, here are some vital facts to bear in mind. Domain flipping is a fairly good way to make money. However, you need to be aware of a few inherent risks. The biggest risk is investing too heavily on this side business. Expecting immediate and huge returns on investments is something to beware of. Not all domains sell for high prices. Indeed, some may not find takers at all. The other major risk can prove to be your mindset. Unless you are prepared to wait to allow a particular domain name to get some popularity in the market, it would be useless to invest. Since domain flipping is unlike any other investment or business, it is important to create your own mindset on how to approach the trade. There are no fixed rules: rather, the market functions on freewheeling basis. Here are some essentials of domain flipping you need to follow. As I mention earlier, you cannot buy a domain today expecting to sell it for a good profit overnight. This business involves patience. Often you may have to wait for months before a customer envisages interest in the domain name you own. Price your domain names realistically. No individual or organization will pay exorbitant rates for any domain: they can easily find cheaper variants and purchase one directly. I remember an instance where someone had bought a domain of a petroleum company based in the Arabian Gulf and was hoping to sell it at very high price. Instead of paying for the domain, the company bought a matching one with the prefix of the country where it is based. The standard practice of flippers is to buy a domain for a year or two. You might be unable to sell these within that period. Hence, the domain seller will ask payment to extend your ownership. If you are confident about the domain name becoming popular in future and enable recovery of investments, it is ideal to renew the subscription. Often, buyers wait for you to abandon a domain name before jumping to buy it. A small investment can prevent this scenario and ensure you make profits. Buying and selling domains is a great way to make some extra money on the side. It might not make you rich instantly. But with some patience and proper planning, you can get good returns. Make adequate allowances to buffer losses if any, caused by domain names that will simply not sell for any reason. Nowadays, a good way to market your domain name is by creating your professional profile on LinkedIn. You can advertise domain names you have for sale and mention their anticipated prices. Since LinkedIn is a network of professionals, you stand better chances of some decision maker noting your list of domains and placing a bid. I want to become a blogger but everything is like a pandora’s box. But this post proved like a booster. I think this would be great option once you get experience in to this field I personally feel this business very interested. Once getting into web designing knowledge, this is what I will love to do now as Beginner loved to learn these kinds of things. Hi Sir/ Mam, I am interested to do but guide me how to start up this business explain in detail. This is Two Thousand Nineteen! I feel the same I just don’t know about set up and transfer items to your site. This is really nice and attracting, it would be achieving to go into DOMAIN BUYING AND SELLING I will give a try and if I find any difficulty along the line I will let you know. Please don’t ignore my comment when I come back to ask a question regarding this. Thank you! It is a quiet interesting business, but i need a guidance from you can you help me in this regard. Going through your post i have create a much interest in starting up this domain biz .But i cant find a responsible person to start it. Please guide me how to start this biz. going through your blog post it amazing and really wao. i have create a much interest in starting up this domain flipping biz for long but i can not find a responsible,trustworthy mentor to put me through. Pls i will be exicted if you can respond to my questions/plea:how,where can i flip my first domain? Like ao much minimum capital can i use to start up with first domain?how can i get market for my domain? “I wish u could be my mentor” Much THANKS IN ADVANCE.